A very icy day on the roads! Oh my, oh my! We didn’t leave Treasure Lake today until nearly 1pm. The camper was a mess with all the work we have been doing in it and I truly dislike moving it dirty plus everything has to be moved in order for the slides to come in. Whilst I cleaned inside, Richard worked outside putting everything away, moving the Suburban and trailer etc. The temperature was cooler than yesterday but we had NO idea what we were heading into. We saw a few flakes of snow but nothing major. Going via the farm where we get out milk the temperature began to fall but yet again we were not too concerned as it is always colder up there. As we headed further northwest though the snow starting come down heavier and the temp continued to drop. Needing to stop to eat, as we came over the bridge into Mt. 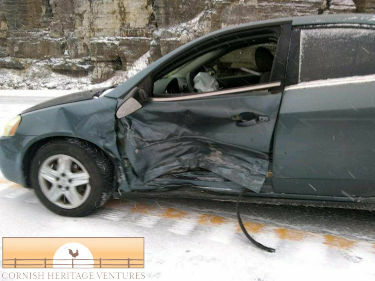 Vernon Richard saw the vehicle in front skid and as we stopped we skidded. We were not going fast as at a traffic light but it gave us an indication as to how bad the roads were. HOWEVER we still had no clue what was coming. Whilst eating lunch I texted Michelle to warn her. She had had to work this morning and so was about 1 1/2 hours behind us. She texted back to say she was just filling up with gas at Ozark, about 30 miles north of Branson. A few minutes later she was on the phone saying she had just spun out of control doing a 360 in the middle of 65 and had been t-boned (hit in the driver’s door) by another vehicle. Praising the Lord that she walked out of the car! Of course she wasn’t going any further. In the meantime we had to make the decision as to whether we went back or carried going forward. We decided to keep going. Richard drove for a while and then I took over as he was getting sleepy. I44 was literally a sheet of ice. Never seen anything like it. Yes, when we lived in Chinook, MT there was a lot of snow and we expected to spend our winters driving on compacted ice in the town but the main roads were always clear. This today was incredible and certainly no fun driving in. Thankfully we have 4 wheel drive. As you know I am not known for my slow driving but today I was only doing 30mph! We saw wreck after wreck, at least 20, probably more as we stopped counting. Two horse trailers had jack knifed and one camper was on its side, well and truly smashed. The towing companies were doing a big business today! As we drove and darkness began to fall we wondered if we would even make it to our destination in Bartlesville, OK. Knowing of a campground in Vinita we contemplated stopping there but as we got closer to Vinita the roads cleared and so we decided to continue on. The phrase “mad dogs and Englishmen out in the noon-day sun” kept coming to me today. It should have been “A mad parrot and Englishmen out in the frigid air”! Arriving at a destination in the dark is no fun at the best of times but it is even worse when it is only 16F out there! The camper was at 33F when we opened it up! Brr…. Couldn’t hook up the water tonight but at least we have warmth! SO we are here. Sorry Michelle hasn’t made it but she may get a ride out tomorrow depending how she feels in the morning. I know she really wants to come but this has been quite a shock for her. She also needs to get to the chiropractor to get checked out after the jolt. Her car is probably totaled due to the damage. She was able to limp it to a parking lot but friends are going to tow it for her when the weather improves. Please pray for provision as she only has liability insurance so right now the insurance are saying they won’t pay anything towards a replacement/repair. Oh, NO! Glad she is okay. Hope she can make it out to camp for at least a few days.